The first two phases of the 350-unit residential development at the site of the old Hawkhead Hospital in Paisley, near Glasgow, have just reached completion. 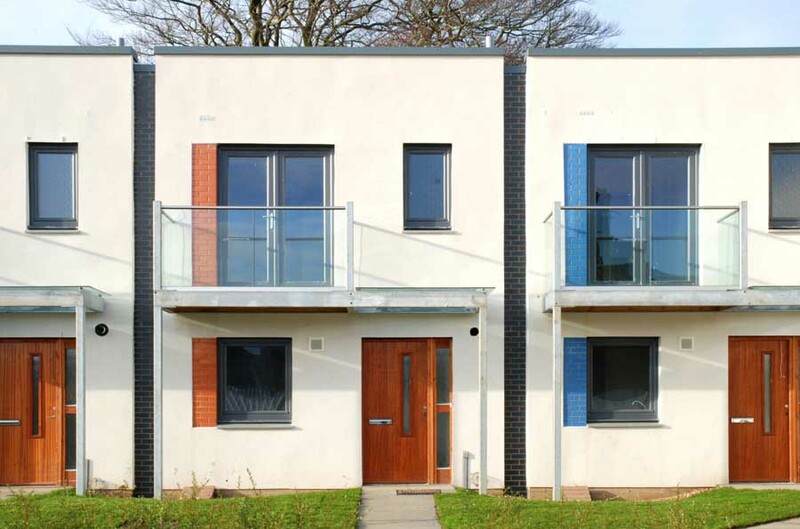 Designed by architects Holmes, the completed three-storey block with 18 flats and the two-storey terrace with 7 houses both demonstrate the ambitious design concept of creating new-build properties to compliment the original Thomas Tait’s 1934 hospital buildings. Many of the original buildings still exist on the site and are to be refurbished in the near future. The Tait buildings represent one of the early examples of the modernist movement in Scotland. The old concept of Victorian hospital design was replaced by the clean lines and white walls of the new architectural style. The new-build blocks by Holmes pay homage to their ancestors with clipped roof edges, white render and glazed brickwork as a contemporary reference to the faience used by Tait. The three-storey flatted block faces out of the site across open land to the busy Hawkhead Road and detached houses beyond. This elevation adopts a similar buff brick to Tait’s Ross House building on the site and is split vertically into 4 sections to reflect the lower scale of the existing houses on Hawkhead Road. These splits occur at the vertical glazed main entrances which are also celebrated with short side walls and glazed canopies. The vertical glazing covers a double-height entrance lobby with open stair and glazed handrails beyond. Slender glazed brick panels are incorporated at windows in a rainbow pattern across the façade. On the elevation facing into the site and forming a three sided courtyard with the Tait buildings, the treatment reflects the white render and horizontal proportions of the main hospital buildings. The glazed brickwork on this elevation is confined to the sides of the main stair vertical glazing. At gable ends, in a reference to the original ward block bay windows, the internal spaces are allowed to push out through the masonry into light weight aluminium clad bays with generous windows and glazed balustrades. All the flats have balconies with glazed balustrades and full height windows to open plan kitchen, living, dining spaces. The terraced houses form an “L” shape to create a courtyard in front of the original staff cottages. The leading gable of the terrace leads on from the Tait Gate Lodge and the corner balcony and canopy references back to the open logia of the lodge. The cottages again have the clipped edge roof form with a mono pitch roof taking rainwater to gutters and downpipes on the rear elevation. The identity of each house is encouraged by a dark gray glazed brick shadow gaps on the party wall line and the coloured glazed brick panels at windows, where each house has its own colour. The site is fully landscaped with grey block paviors for access roads and formal hedge planting reinforcing the external spatial arrangements. 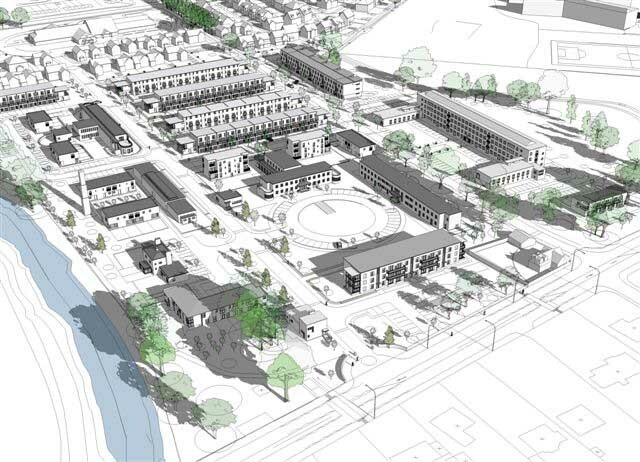 Leading architects, Holmes Partnership, are designing 200 new homes on the site of Hawkhead Hospital in Renfrewshire. The original hospital was designed in 1934 by Thomas Tait, one of the most important and prolific Scottish architects of the first half of the 20th century. Originally known as the Paisley Infectious Diseases Hospital, Hawkhead Hospital will be transformed into a unique and highly desirable residential estate. Holmes prepared the masterplan for the redevelopment of the site for client, Kier Homes, who are acting in partnership with the Burrell Company. While Elder and Cannon Architects and the Burrell Company is responsible for the refurbishment of the existing buildings, Holmes is designing and delivering new build houses and apartments that will compliment the original 1930s designs. The hospital was created in the new modernist style which was becoming popular in the 1930s. The smooth clean appearance of the architecture suited the new medical practice of open light and airy buildings separating different diseases into isolated pavilion ward blocks. The design of the new development incorporates a strong sustainability agenda with the objective of creating a vibrant, mixed community incorporating a high percentage of flats, terraced houses and generous landscaped public spaces. Understanding the significance of the historic site as well as its relationship to Paisley and Glasgow have been central considerations. The new build elements of the project, designed by Holmes, are high-quality and sophisticated – flat roofed terraced structures arranged primarily in streets around courtyards and squares. Reference to and respect for the architectural significance of the site is shown through sensitive use of materials and palette, including white render and coloured ceramic clay bricks. Overall, Holmes’ distinctive designs compliment and enhance the 1930s architecture whilst creating exciting and innovative streetscapes in their own right. Extensive consultation with Renfrewshire Council Planning and Historic Scotland took place before planning permission was submitted. A decision on the application is expected in February 2007. Thomas Smith Tait (1882 – 1954) was a prominent Scottish architect who became a partner in the architectural practice of Sir John J Burnett, establishing Burnet Tait and Lorne. His designs include: Adelaide House on the Thames, the Daily Telegraph office in London, St Andrew’s House in Edinburgh and the pylons for Sydney Harbour Bridge. Tait won the competition to design Paisley’s Hawkhead Hospital in 1932. He is best remembered for his contributions to the design and master planning for the Empire Exhibition, Scotland 1938, held in Bellahouston Park. Tait’s vision was of a modernist, utopian future, and the Empire Exhibition was the largest collection of modern architecture built in United Kingdom in the first half of the 20th century. Dominating the whole exhibition was “The Tower of Empire”, designed by Tait himself. The 300-feet-high tower was erected on the summit of the hill in the centre of the park and had three observation balconies, each capable of carrying 200 people. Holmes is one of Scotland’s biggest and most respected architectural practices with a reputation for delivering innovative and intelligent architectural solutions. With offices in Glasgow and Edinburgh, Holmes works with clients across all sectors, including residential, commercial, education, industrial, custodial and masterplanning. 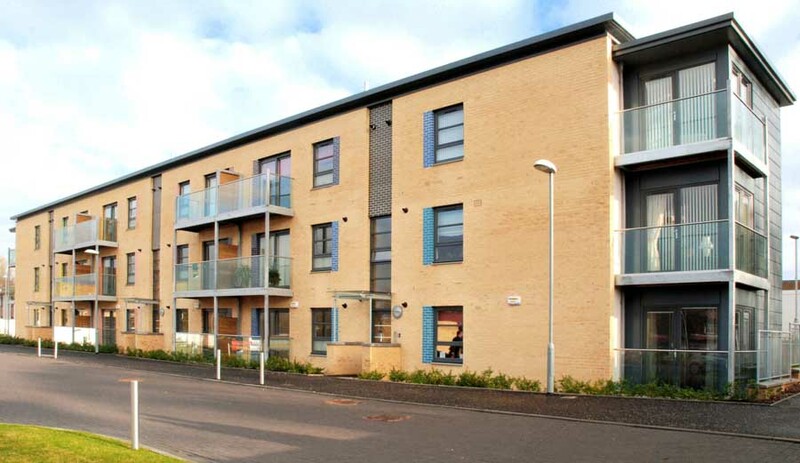 A £500 million workload includes major residential regeneration projects; city centre and business park commercial developments, and an extensive school building program for six (confirm) Scottish local authority clients. Holmes was recently listed in the Architect’s Journal as one of the UK’s top 100 practices. In 2006 Holmes exhibited at MIPIM, the major international property market, alongside ten other practices on a UK architecture stand promoting the work of some of the country’s most respected architects. Hawkhead is one of several sites in and around Glasgow that Holmes is involved in regenerating. The redevelopment of the Canniesburn Hospital site in Bearsden also involves a mix of new build accommodation and restored 1930s Art Deco-style buildings. Mondriaan and Parade Park are major residential project regenerating brownfield sites in the city and Holmes are also the architects implementing the masterplan for the Oatlands Regeneration Project.